To make the squash, preheat the oven to 400F degrees. Oil a sheet pan, and place the squash cut side down on it. Place in the oven and roast until the squash is tender, about 45 minutes to one hour. Meanwhile, while the squash is cooking, to make the filling, combine 2 tsp avocado oil, the onions, mushrooms and garlic in a medium pan over medium heat, and cook until they are all softened, stirring often. Add the walnuts, thyme, salt, pepper, parsley, and white wine, and stir to combine. Remove from heat. 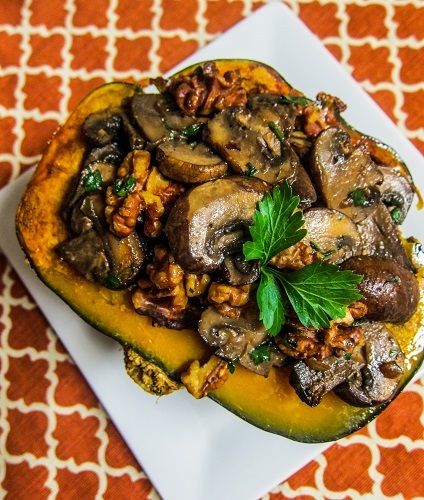 When the squash is done cooking, spoon the filling mixture into it, and serve!